When Willie Irvine broke the clubs post war goalscoring record in 1965/66 he'd netted no fewer than 29 league goals. Having a player score twenty or more was fairly common place then and this was the sixth time in eight seasons at least one Burnley player had reached the target. Willie's injury the following season ensured he was never to reach the magical twenty again and so we waited, and waited, and waited for the next player to make it, indeed we waited over a quarter of a century. In the summer of 1991, having failed in the promotion play offs, Frank Casper made a number of signings to strengthen his squad. One of those signings was of a little known Scot by the name of Mike Conroy. He'd started his career with Coventry before moving back north of the border to play for both Clydebank and St. Mirren. He signed for Reading in September 1988 for £50,000 but in three seasons at Elm Park he was hardly a success and played much of his football in a midfield role after failing to score enough goals up front. When he came to Burnley three years later he cost us £35,000 and there were strong suggestions that then assistant manager Jimmy Mullen was the instigator of the move. Conroy started well and netted in each of his first four games. One of them was against Aldershot, a result and goal now removed from the records whilst another was in the League Cup against Wigan. Injury and a loss of form meant the goals dried up but he was soon back to scoring form including two at Northampton and that late winner with the crowd celebration with the crutch. He reached double figures against Doncaster at Christmas and in early January he turned in an amazing performance against Gillingham. He scored early but then went on to miss three golden chances in the first half after the Gills had equalised. But after the break he came back and scored twice more for his first and only hat trick for the Clarets. That was during a run when he scored in six successive games. When Conroy scored the only goal in a vital game at Mansfield he'd finally broken that twenty goals and went on to score four more and end the season with 24 league goals plus five more in cup competitions. 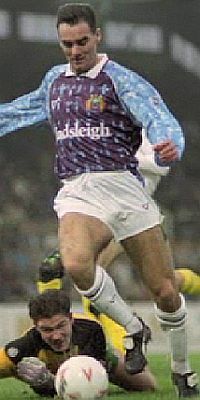 He found goals more difficult to come by in the following season but linked up well with new signing Adrian Heath as we had a comfortable season in the higher division, but at the end of that season he was one of a number of players deemed surplus to requirements by manager Mullen. It all ended acrimoniously as Conroy, still a Burnley player, was spotted in the stand celebrating a Preston goal against us in a League Cup tie. He was soon to join the Deepdale club in a £85,000 transfer. He continued to score goals in two seasons at Preston and another two and a half years at Fulham before joining Blackpool in March 1998. He failed to score a goal for Blackpool and his playing career came to an end in a loan spell at Chester, played his last game for them in April 1998 for them against Rochdale. A new life in Australia beckoned and he's still involved in the game as a coach on the other side of the world. He'll always be remembered at Burnley, you can never forget a goalscorer, and his goals finally won us the promotion we had waited seven long years for.